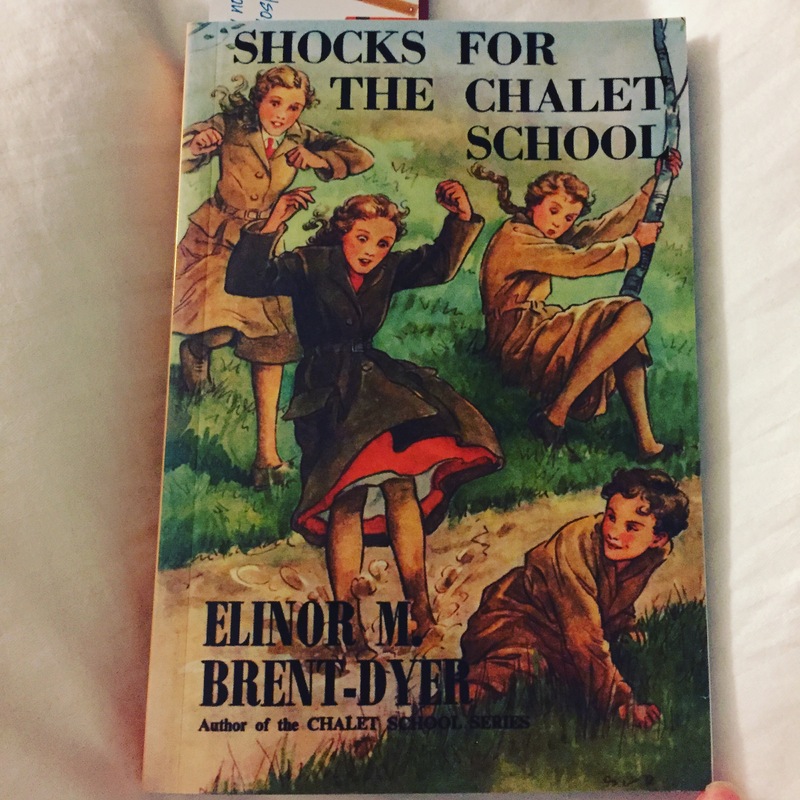 An unusual choice for BotW this week – Shocks for the Chalet School was one of my post-Paris purchases from Girls Gone By and it turned out to be that rarest of things – a Chalet School book that I hadn’t read. I know. Who knew. And this also gives me hope that there may be more! Shocks for the Chalet School is the book where Emerence Hope bursts onto the scene. Now I think that the reason why I thought that I had read this is partly because her early antics are talked about so much in the later books, and partly because it takes place at the same time as Chalet School in the Oberland. For those of you who are not Chalet afficionados (and I appreciate that early/mid 20th century boarding stories may not be your speciality) a quick recap on where we stand at this point in the series: It’s after the war and the school is on St Briavels Island after the problem with the drains at Plas Howell. The new term means a whole new team of prefects – as the finishing branch is just starting in Switzerland and many of the Sixth formers have left to go there. Mary-Lou is still a Middle-schooler, Jo and her family are in Canada with Madge and her family and the book opens with news of the arrival of Jo’s Second Twins and a letter from former teacher Miss Stewart (now married) apologising for having unwittingly unleashed Emerence on the school. With me so far? Really all you need to know is that a (very) naughty new girl is arriving at an established boarding school, where an inexperienced team of prefects will have to try and deal with her. Who knew it was that simple to explain! I’ve mentioned my abiding love of the Chalet School before on this blog, and reading one for the first time reminds me how much. Yes, they are dated – and in the Girls Gone By reprints you get the original unabridged text complete with smoking teachers and problematic racial sterotypes. They are of their time. The plots are some times repetitive; Elinor M Brent-Dyer has favourites and doesn’t know how to make lists (or do continuity in some cases); there’s an unbelievably high number of dead parents and “kill or cure” operations; there are huge families, religious messages and you would never try and bring children up like this today. But with an appropriately sceptical eye and a tongue in cheek where necessary, they are joyful. No one gets bullied, very few problems are completely unsolvable, no one is homesick (for long at least), Joey (the series’ main heroine) can sing people out of comas and if you’re a good girl, you’ll get to marry a doctor and live happily ever after, popping out babies in a Chalet near the school! Basically a new (to me) Chalet School book was exactly what I needed to bring me out of my World Events-based slump. And I got an unabridged copy of Rivals for the Chalet School a couple of days later too so got to read the missing bits in that as well. If you’re not already a boarding school fan, then these probably aren’t for you – so may I instead recommend Cathy Bramley’s Wickham Hall serialisation – the final part of which came out last week. I love the Chalet School books too probably because of how dated they are. We have a running joke in our house about Jo’s ‘horror of sophisticated children’. She was obsessed with doctors though, Even the one book written for adults of Brent Dyer’s I’ve read the heroine ends up with a doctor, it’s a theme!